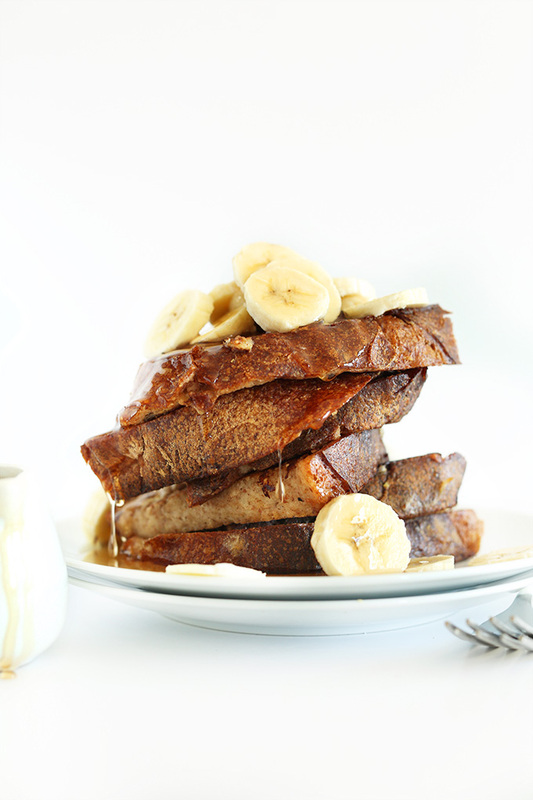 If you love banana bread and you love french toast, you will LOVE this 5-Ingredient Vegan Banana French Toast! That’s right, 5 ingredients. Six if you desire a splash of vanilla. But it’s not necessary! You really want the banana flavor/sweetness to shine through anyway. Plus, it takes the place of a sweetener and an egg in this recipe. Bananas seriously have it going on. The batter is simple to throw together. Just mash your banana, add the other ingredients and wait while you preheat your griddle. Then dip, soak and cook! Look how golden crispy the edges get. SO seriously yum. The best part? You really can’t tell the egg is missing. I was pleasantly surprised! 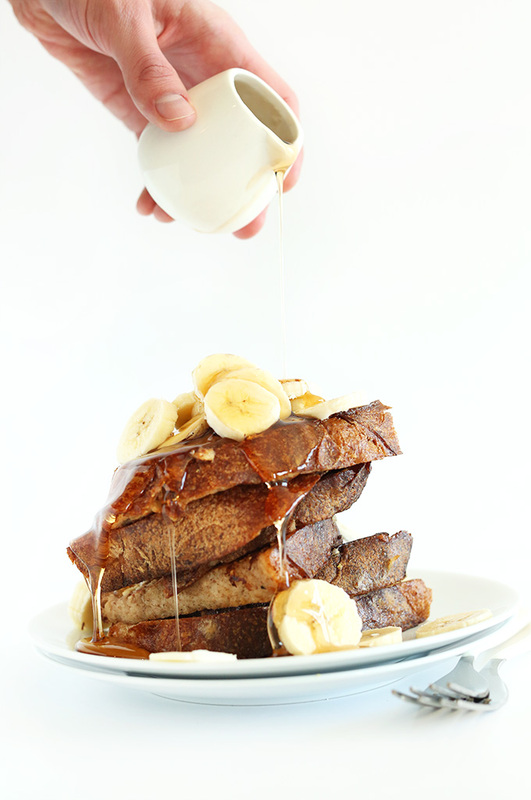 One Bowl Vegan Banana French Toast that's reminiscent of banana bread. Super moist, tender with a slight crisp. Perfect for quick weekday and slow weekend breakfasts. Let batter rest for 5 minutes while you preheat your griddle or skillet to medium heat. Once your surface is hot, coat generously with vegan butter or coconut oil (I used Earth Balance because I like the flavor). Dip your slices of bread into the batter and let it rest for 5-10 seconds on each side, using your fingers to make sure it's fully submerged. Transfer immediately to griddle. An optional step is to sprinkle the freshly-dipped sides with a little almond meal for added texture. Cook for 3-4 minutes on each side or until evenly golden brown. Flip carefully using a sturdy spatula as the banana mixture can be a bit sticky if you're not gentle. If your french toast appears to be browning too quickly or burning, turn down your griddle. Serve immediately with desired toppings. I think peanut butter and maple syrup are all you need here. This was pretty good. I used 1 cup of almond milk and 1.5 bananas and let it sit for 15 minutes or so and the batter thickened up nicely. My first couple of slices did stick, so with the second batch I used a lot more earth balance and really pressed down on the spatula head to get the browned batter up when flipping the bread, which worked. I warmed it in the oven on 225° which helped it firm up a bit more. I like a lot of seasoning so I sprinkled extra cinnamon on top while it cooked. I used thick French bread. I might try something denser next time for a firmer texture. Thanks for sharing your process, Anna! Can this Vegan French Toast be baked instead of fried? My son is avoiding using any kind of oils/vegan butters. This was delicious but way too soggy. The sogginess didn’t even cook out after quite some time on the griddle. The pan was also so sticky and messy that I gave up after the first round of three toasts and served the remaining liquid as a smoothie. I normally read comments first so at least know what to expect but just didn’t do that this time. Salutations; I am recently vegan and interested in trying to make this. We haven’t tried that. But if you do let us know how it goes! Made this frenchtoast for the first time for our family Easter brunch and it was delicious. It was a big hit with everyone and even with the non-vegans, the egg was not missed. Used up a whole small loaf of bread with this one batch of batter. Very yummy. Glad I found your site. Tried this. It was awful. Stuck to everything even with non-stick spray and earth balance. Got dark but was soggy. Tossed three pieces and used a different recipe. Usually I’m a huge MB fan but this was a total flop. Sorry to hear that! What kind of bread did you use? Really good, thick rustic whole grain bread. This French toast recipe is delicious! I put them in the oven afterwards so they aren’t as soggy. Also with left over mixture I add some baking powder and flour until I get a pancake looking mixture and they are great! If you do pancakes with this mixture I add a little bit more flour then what you would usually do and the first one may not be perfect but just continue making them and it should be fine. I made this and it tasted good, but it burnt all splotchy like … not the whole bread did … and I have an electric stove and was only on 3 … which I started at medium heat but it seemed like it wouldn’t cook all the way through and still burn so turned it down and it cooked through, but it still got burnt. Any suggestions? Total fail! I dipped the bread into the bater for a second on each side to be safe, and followed the directions (for once) carefully as I am not well versed in french toast. Once cooking the bread turned to soggy mush. On the bright side, I added whole wheat flour & baking soda to the batter and now we are having successful pancakes! 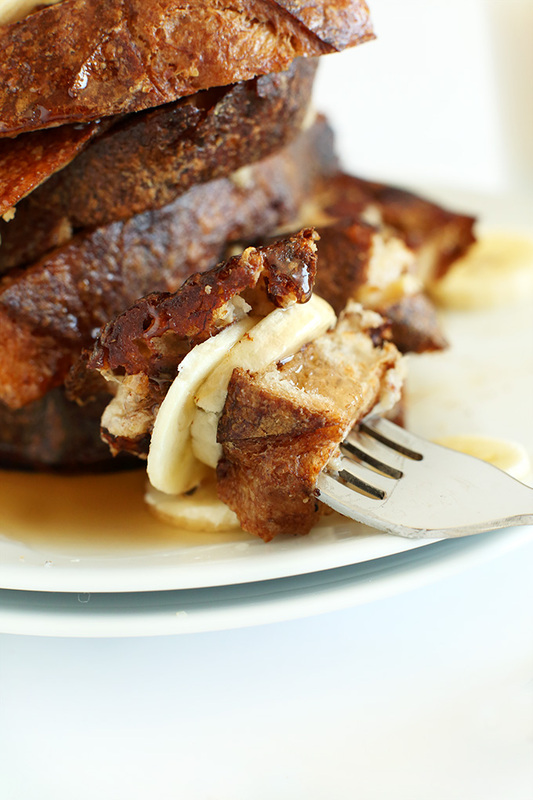 This is probably the best banana french toast I have tried! I will definitely try it again! This was hands down the worst recipe I have ever tried. I should have read the comments first. There is entirely too much milk and I woke up with waterlogged nasty bread. Just scrap this one and find a different website from a different person. Whoever put this together was on ludes. Mine was extremely soggy and stuck to the pan. I tried many different vegan butters and sprays and it still stuck. Not a good recipe. This recipe is fantastic! I hadn’t had french toast in years since becoming vegan. I made this recipe subbing chia seeds for the flax seeds, and using some stale store bought wheat bread. They turned out great in no time at all! Thanks! Oh wow. Just made this and it’s fantastic! Made plenty of batter.. just wish i had more bread!! Blended the banana, a/milk & flax powder in a nutribullet, sprinkled cinnamon over while frying and served with maple syrup. Am so happy.. thank you!! Can this be made using soya milk instead of almond? Hi Amy! That should work! Happy cooking! Curious about the nutritional breakdown here. Does it not include the bread itself? I ask because my go-to bread is 120 calories per slice by itself. Thanks. This is so delicious! I’ve always loved French Toast, and haven’t had it since going vegan. Happened upon this recipe and just made it. O.M.G. My taste buds are so happy! Came out a little soggy, as others mentioned experiencing, and didn’t brown evenly, so didn’t look the prettiest, but it was perhaps the tastiest French Toast I’ve ever had! Yay, being vegan doesn’t have to mean feeling deprived of your favorite foods! Thank you. Look forward to trying other recipes of yours! I made this with your Whole Grain Seeded Bread recipe and it was incredible! I even used stale bread, but I guess it wasn’t hard enough, cus mine also turned out quite soggy. Regardless, it didn’t taste bad at all. You could probably leave it out Arpine! Me and my 7 month old enjoyed this french toast for breakfast this morning. Subbed chia seeds for the flax and coconut milk for the almond. Deee-licious. It looks so good, but I don’t have any type of vegan milk U-U is there anything I could use in place of it? Love this recipe! I always adored French toast as a little girl and have missed it when I went vegan. Not anymore! I’m still waiting to try French toast with the Follow Your Heart vegan egg. This was amazing though! I used a little over a half cup of soy milk and half a mashed banana to make a single serving. So good!! Just made this for my son and girlfriend and the bread I used didn’t hold up, which was fine not mad or anything so I used tortillas! I doubled the recipe, so I have about half of the batter left and I’m just gonna turn those into pancakes. What’s that saying when life gives you lemons, make lemonade! Lol!! I normally don’t leave reviews but I felt like I had to for this recipe. This is the most amazing French toast ever! If you’re vegan I recommend you memorize this recipe because you’re going to be making it a lot!! What about yeast? That’s a living organism. Mel all plants are living organisms. Yeast is actually a fungus, not an animal. I’m confused, bread is made with eggs. So how is bread vegan? I don’t think that works as vegan. Bread actually isn’t made with eggs, traditionally. Most store-bought and homemade versions are naturally vegan! Hello! Is there anyway I could do this by changing the flaxseed for quinoa? Our first attempt left the batter stuck to the griddle instead of the bread. We had it set to 350 degrees. Any ideas on how to improve this? I thought the crust came out a little bitter. I used fresh ground flax.. I think it may have gotten slightly burnt. Thought the recipe was a bit heavy on the banana flavor too. Was good with strawberries and soy whip! I loved this recipe. It taste like French toast but even better. I blended the banana mixture to make it smoother. I also added a little extra almond milk and only dipped the toast for a few seconds. I topped mine with sliced bananas, walnuts, powdered sugar, and syrup. Thank you for this recipe it was super delicious! Yum! I used both flaxseed meal and whole flaxseed after reading the comments regarding soggy results. Mine came out perfectly! Also heated pure maple syrup, added chopped walnuts, and sliced bananas to pour over the top. Delish! Thanks for the recipe!!! Just tried out this recipe and it was delicious! 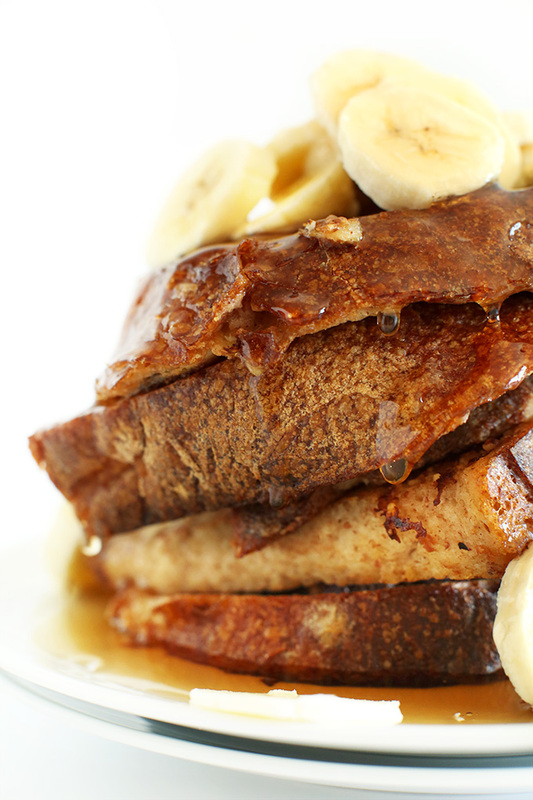 It tastes like banana pancakes mixed with the texture of french toast. So quick and easy to whip up too! Very bad results. Followed directions exactly and all that results is a lot of dishes to clean and very mushy bread. Banana is perhaps the wrong choice for replacing eggs with. Tried the same mix with actual egg and it worked. Go figure. These were deeeeelicious! Thanks for keeping it simple! I have made this twice now and it’s always delicious! I use sprouted grain bread (Silver Hills’ “Mack’s Flax”) and it comes out perfect- the drier texture of this bread helps it from not becoming a soggy mess. I do cook on low/medium heat for more time than the recipe calls for, flipping a few times throughout, until the center is no longer mushy. In addition to the cinnamon and vanilla, I also add a little bit of nutmeg or ground allspice to give it a little extra something. I also use a little bit of Earth Balance in the pan for each slice of toast. Top this with slices of strawberries and just-ripe banana, and pure maple syrup…yum! Much healtier alternative than regular French toast. My husband who is neither vegetarian or vegan even loved this recipe. I dont like cinnamon! Can i make it without it?? I’ve made it with and without :) It doesn’t change the consistency – just adds flavor. I want to make a vegan French toast bake recipe for a party of 10 people. Can you suggest some changes? Sorry I haven’t tried this baked or else I would! I’ll add that to my list. first of all- this looks to. die. for. omfg. i have been craving french toast these past few days like there’s no tomorrow and this looks amazing! I think so! I didn’t try it this way myself, but it should work! check back if you do! Once again I’ve come across another recipe that doesn’t fail, thank you for all that you do! I can NOT wait to add your cookbook to my collection!! Back to this meal, I followed the recipe almost exactly, I used sprouted for life bread (I’m gf) and I didn’t have almond meal so I sprinkled corn meal on top, this was an amazing meal, thank you again and again! I have been vegan for about 13 years now. I mostly ate raw and bread here and there. I have never used the internet to really help with my self recipies. Then my wife (vegan as well) came across your site and we have been slowly making our way through. Every recipe we have tried is just simply amazing! Just tried this one and it’s great! Thanks! First of all, THIS IS FANTASTIC. Second of all, as a poor college student, I had all the ingredients in my kitchen. I made it with original Ezekiel bread, and have already made it twice (discovered the recipe yesterday). I have been vegan for about 8 months, and was craving French toast, so when I found this I had to make it!! And of course I doused it in maple syrup and peanut butter :) give this recipe a try! SO happy so see this recipe has NO TOFU!! 10 year vegan who hates toful ; ) Thanks SO much! This recipe sounds delicious and I’m so excited to try it! I’ve been missing french toast ever since my switch to veganism about a year and a half ago. Do you leave your flaxseeds whole or is mashing them into flaxseed meal the best option for this recipe? Thanks! Thanks for the great recipe -it was Delicious! I made it with rice milk and gluten free bread. wow looks delicious. can never go wrong with french toast. definitely a recipe i will be making… thanks! So so so delish! I was watching a youtube star – Karissa Pukas – who shouted out your vegan blog and said it’s amazing! Boy oh boy I agree!! This recipe turned out amaaaazing!!! Instead of just adding flaxseed in, I made a flax egg by combining ground flaxseed & water …. I duno if it makes a difference but it was “eggy” and delish! Followed the recipe and after having 3 pancakes hopelessly stuck in the pan, I switched pans and used non-stick oil, still a lovely crust stuck on the pan bottom and a pale, but still very tasty French toast. I’ll likely not make them again, unless you can tell me what I may have done wrong? Still, I love vegan versions of traditional foods and appreciate your site. Hmm, I used a nonstick skillet and put down vegan butter before grilling. Didn’t have any stick at all. Perhaps it was the pan you used? Not sure! Sorry I couldn’t be of more help! I just made this. It was a little soggy, but really good. Sadly I had no coconut oil, or normal oil, so I had to use olive oil, but the peanut butter masked the taste c: I loved it! Glad you liked it Synne! I think I’ll add a note that this one works best with heartier bread. Sandwich bread isn’t as ideal. Thanks for sharing! Hmm, then perhaps your banana was not large enough. It should be fairly thick. Also, more sturdy, rustic breads do better here. Hope that helps, Monika! For everyone looking to try this recipe- TRY THIS RECIPE. I’m enjoying my last bite as we speak. 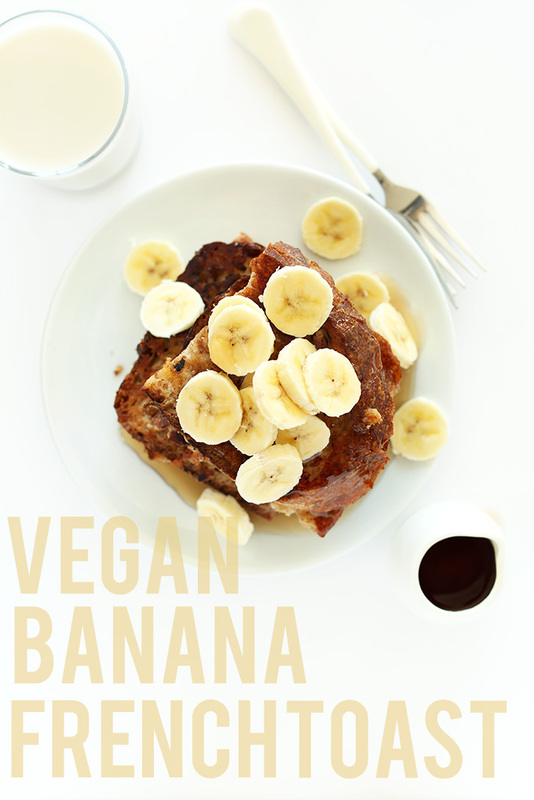 Even if I wasn’t vegan I would choose this recipe over traditional french toast. 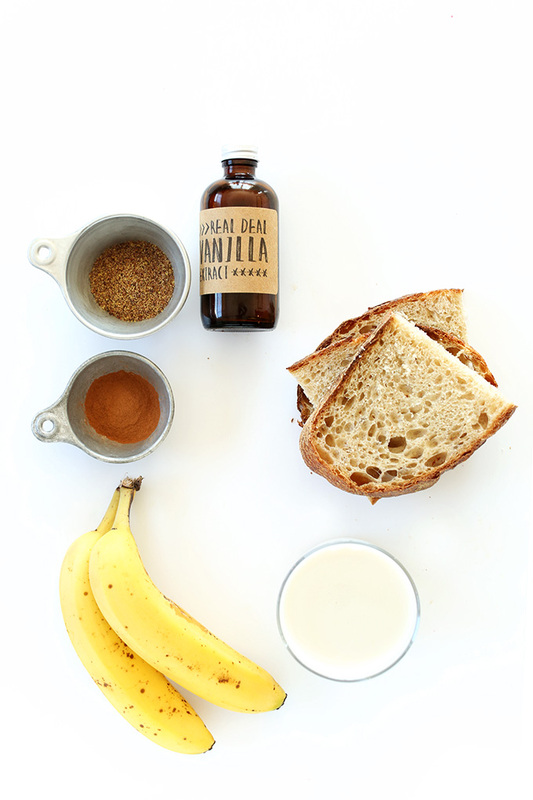 The banana adds so much flavor and sweetness, and the almond milk keeps the bread from getting too soggy too quickly. I had both vanilla extract and almond meal on hand and thought it was just the right amount of nuttiness. 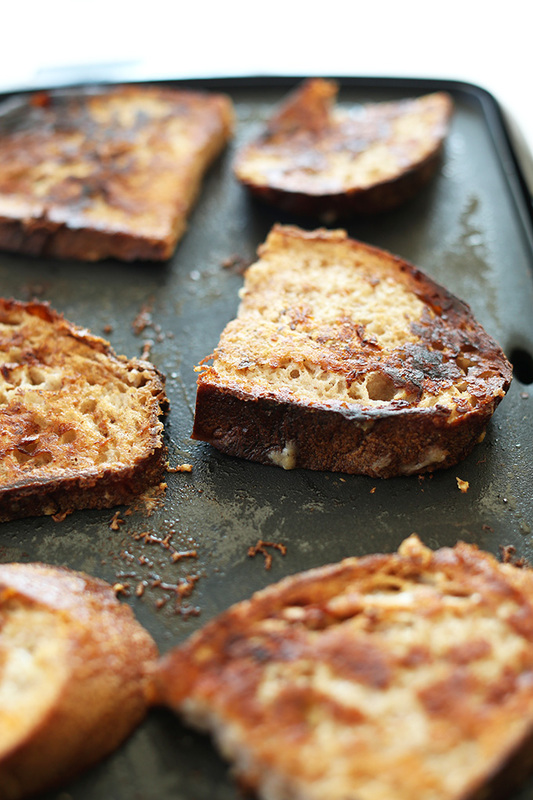 The almond meal added a very tasteful crunch to the french toast, especially when grilled. I would absolutely recommend trying out this recipe! With supervision, however, because I ate an entire stack by myself. Rookie mistake! Thanks for sharing! So glad you liked it! Is the flaxseed in this recipe ground or whole? Thanks! Great recipe! It sounds and looks sooooo damn delicious! I’ll save it and scroll through your blog. I also write a vegan food blog, maybe you want to check it out. Yes! I’ve made bread pudding without eggs before and was surprised how it still turned out so well. Oh, this looks so delicious and I will be making it oh-so-soon! Quick question, do you grind the flaxseed or leave them whole? WOW! This looks fantastic, and I’m all about recipes that don’t have a million ingredients so this looks perfect! 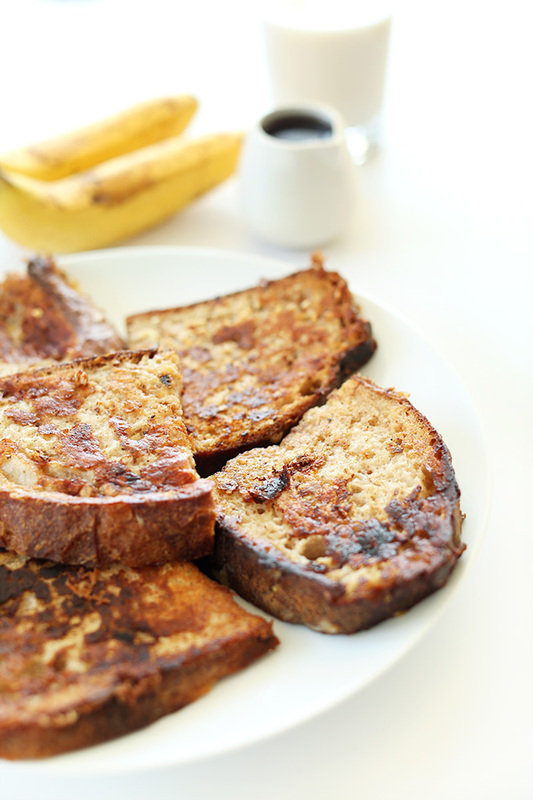 I love french toast but this is the first gluten free recipe I have seen, thanks! Can’t wait to try it. I remember your banana mashes from way back! I had never tried it so I was pleasantly surprised when the method worked so well! Oh my goodness!! Those pucs make my instantly crave those! Oh good! Hope you enjoy this healthy, eggless version, Elisa! Thanks for such a great sounding, simple vegan French toast! Yet another brilliant recipe! It was the third I’ve tried from your site and I couldn’t be happier. Thank you for creating such beautiful and delicious dishes. Yay! Thanks for sharing, Maddie! Great recipe! Just wondering if subbing soy milk for the almond milk would work? Where do you get that wonderful looking rustic bread? It looks perfect for French toast and I would love to try the recipe or know where you purchased the loaf! I just get it in the bakery section at our grocery store. Otherwise, panera and local bakeries are great options! Thanks so much, I like to make our bread so I think I will look for a recipe. I can’t wait to try this French toast! Oh my goodness this looks AMAZING! I was planning on making your pumpkin pancakes for dinner, but now I think I might have to make these. Or maybe both? Haha. BOTH. Your thesis can wait! Can’t wait to try this recipe. I just bought a loaf of whole wheat rustic bread yesterday and I didn’t know what to do with it. My jaw dropped. LOVE this! I was going to say that I even like how it would be a healthy breakfast to make, but then I remembered how much maple syrup I like to drown my french toast in! Definitely worth it though–this looks delicious! so true! pancakes, waffles and french toast are destined for maple syrup drowning in this house! Definitely! I have recently been trying an egg free diet and I have to say I don’t really miss them at all. 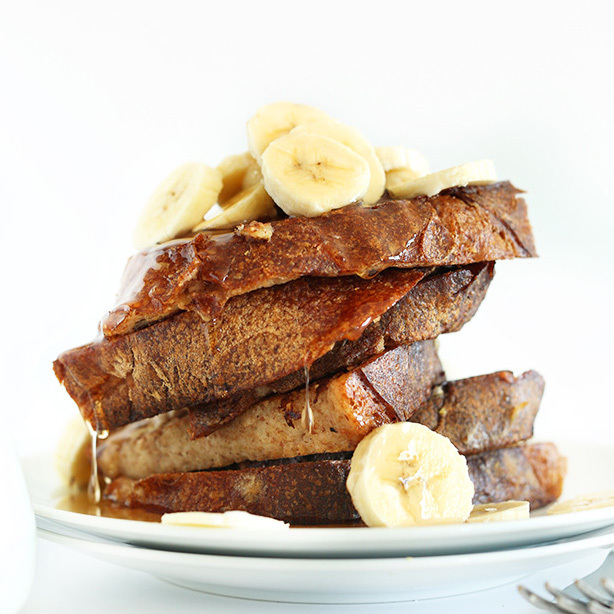 This french toast fits the bill when I’m craving something sweet but still vegan! Hope you enjoy it, Maryea. Can This receipe be made an advance and still be good? French toast will forever be my favorite food! I’m not picky on the exact flavour either!! Love this recipe! How come mine came out soggy?! I followed the recipe! I used thick sliced wheat bread, too. Hmm, not sure! This may have happened because your banana was too large. If the batter appears gloppy, add a bit more almond milk to thin it out. And next time, don’t soak the bread as long. Hope that helps! I still ate it lol it was more like a moist banana bread w/almond butter, I will be mindful about the amount of banana next time. It was still good lol. Mine was soggy, too, but I think it’s due to using sandwich bread rather than sturdy rustic bread. I read that fresh bread will probably come out soggy, so you should use stale bread instead. If you don’t have any stale bread, leave some out overnight to dry or place it in the oven at the lowest temperature for about an hour.